Can I have Tents, Bounce House, Rides and/or other Entertainment at my event at Endicott Park? May I donate a tree to be planted at Endicott Park in memory of someone? What is the Town’s Memorial Bench Program? Can I take professional photos/portraits at Endicott Park? Can I have a camp fire at Endicott Park? Are there grills available for my picnic at Endicott Park? Who cares for the farm animals at Endicott Park? Can I camp at Endicott Park? Is there a Parking/Entrance Fee at Endicott Park? Is alcohol allowed at Endicott Park? Are dogs/pets allowed at Endicott Park? Do I need to bring my own chairs and tables for my event at Endicott Park? Do I need a reservation (permit) for my family picnic or company outing at Endicott Park? Does Endicott Park have a trash policy? How do I rent space at Endicott Park’s Community Gardens? How do I reserve picnic area space for my family picnic or company outing at Endicott Park? Does Danvers have a dog park? All organized groups of any size, or event at Endicott Park requires a reservation & permit. Any reservation requesting use of: Tents, Staging, Canopies, Rides, Bouncy Houses, Catering and/or Entertainment must submit a Certificate of Liability from the equipment vendor with your application. The Certificate of Liability must list “Town of Danvers” as additionally insured. Endicott Park no longer accepts (memorial) tree donations but exceptions may be made in certain instances. Instead, we recommend individuals consider our Memorial Bench Program. Photo courtesy of Robert Clough Jr. 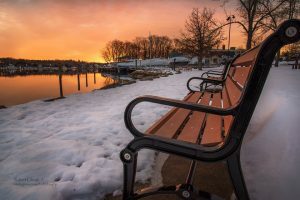 The Town of Danvers offers a memorial bench program for those interested in donating a bench for installation on Town property to memorialize or honor someone special. All donations must be approved by the Board of Selectmen. Additional information and policies are listed below. Applicants must read the memorial bench information and policies, fully complete the application below and return the completed application to the Danvers Recreation. Danvers Recreation and Town Officials make all final decisions, including, but not limited to the location and style of the memorial bench. All memorial bench requests must be accepted in accordance with the Town of Danvers gift policy. All inscriptions are subject to approval. The applicant is responsible for maintenance of the memorial bench beyond the period covered by the warranty and/or maintenance during the period of the warranty that is not covered by the warranty and is not the result of normal wear and tear. The Town of Danvers reserves the right to deem the bench unserviceable and remove same as necessary. A check for the cost of the bench must accompany your completed application. Once your completed application is received by Danvers Recreation, it will be reviewed and you will be notified of our decision. Benches will be installed by the Department of Public Works. Questions and concerns regarding Memorial Benches should be addressed to the Danvers Recreation Division. Endicott Park makes a beautiful background for your personal photos though for-hire photography in Endicott Park requires approval through our permit process. Click here for photography permit reservations. Fires are not allowed without prior authorization. Smaller/fixed charcoal grills are available in the Pond picnic area without reservation for small family use. Larger/portable charcoal grills are available upon request for larger permitted groups. You must supply your own charcoal grilling tools. All our farm animals are cared for daily by our trained Park Staff. They are vaccinated and visited regularly by a Veterinarian. Our Children’s Barn offers visitors the opportunity to view domestic farm animals housed in an historic farm building. Both structured and informal talks are conducted by the Park Staff for elementary level education in animal husbandry and the functions of a barn in the 19th century. One of the challenges of maintaining an active barnyard in a public park is developing an understanding that domestic animals are cared for differently than a household pet. If you have questions about these differences please ask a member of our staff. No. Endicott Park is not a campground and does not permit camping or overnight use. Yes. There is a parking fee on Weekends and Holidays of $1.00 for Danvers resident vehicles and $3.00 Non-resident vehicles. Weekday donations are appreciated. Alcohol is only allowed in Endicott Park with an approved One-Day Liquor License. Without a One-Day Liquor license, possession and/or consumption of alcoholic beverages is prohibited. Yes. Pets are always welcome but must be on leashed unless in the designated Dog Park. Dog waste transmits disease and contaminates water supplies so please pick up after your pet. There is $25-$100 fine for failing to comply with these Town By-Laws. Your picnic area reservation comes with at least ten picnic tables. You may bring additional chairs, tables, shade tents, nets and sports equipment as long as they don’t negatively impact the experience of other park visitors. Activities of a higher impact may be allowed with prior approval. Check with our staff before your event. Yes. One of the ways we keep our park so clean is by having a Carry In/Carry Out Policy. There are no trash barrels in our park. We ask that our visitors take their trash with them. We understand that our larger permitted groups will accumulate a lot of trash and therefore if you would like trash bag removal at the end of your event, we ask that you leave your bags along the roadside adjacent to your picnic area for Park Staff to collect. Permit holders are responsible for picking up any trash generated from their event. Trash bags will be provided at your request. Failure to clean up your permitted area will result in a minimum fee of $100. The permit holder will be responsible for any damage done to the property during the term of the rental agreement. All dogs must be legally licensed and have proof of current rabies vaccination. All dogs must be leashed upon entering and leaving the dog park. Dogs in heat or younger than 4 months are not allowed in the park. No more than two (2) dogs allowed, per owner or custodian, at one time. Dogs must be removed at first sign of aggression to other dogs or humans. The owner or custodian of the dog must remain in the dog area with the dog. Dog feces & trash must be cleaned up by the dog owner or custodian. Holes dug by dogs must be filled by the dog owner or custodian. No pronged training collars or choke chains allowed. No smoking, glass containers or food of any kind are permitted in the park. No dog treats or toys are permitted in park. Dog handlers must be at least 18 years of age or older. Children under the age of 12 are not permitted in the park. No large dogs (greater than 25lbs) are permitted in the small dog enclosure. The dog park is closed when Park Staff are conducting maintenance. Owners or custodians are responsible for all actions of their dogs. Violators are subject to removal and/or exclusion from the dog park. The Town of Danvers does not assume responsibility for injuries or damage to personal property. For all other questions/concerns call (978)-774-1213, Ext. 8 and leave a message. The Endicott Community Gardens are located in Endicott Park, just past the entrance off Ingersoll St. There are 196 25’x25′ garden plots (with some variation) available for rent from April through November for $30. About 5% of our garden plots open up each year and become available. Danvers residents are given priority. Community Garden space rentals are managed by the Friends of Endicott Park, Inc. Please contact Randy Boudreault (978) 430-9777 or rboudreault@svb.com for more information. Due to the overwhelming number of requests we receive annually for picnic areas, the Town requires any organized group or family outing to make a reservation and obtain a permit. The permit reservation ensures we have the space available for your group. Click here to obtain an online permit reservation. Yes, the Danvers Dog Park is located at Endicott Park, 57 Forest St. Best access is to use the Dean St. entrance off Forest St across from St. Richard’s Church.